Digitalisation has enabled the emergence of low value consignments trade and has established a platform for SMEs in developing countries to participate in global trade. 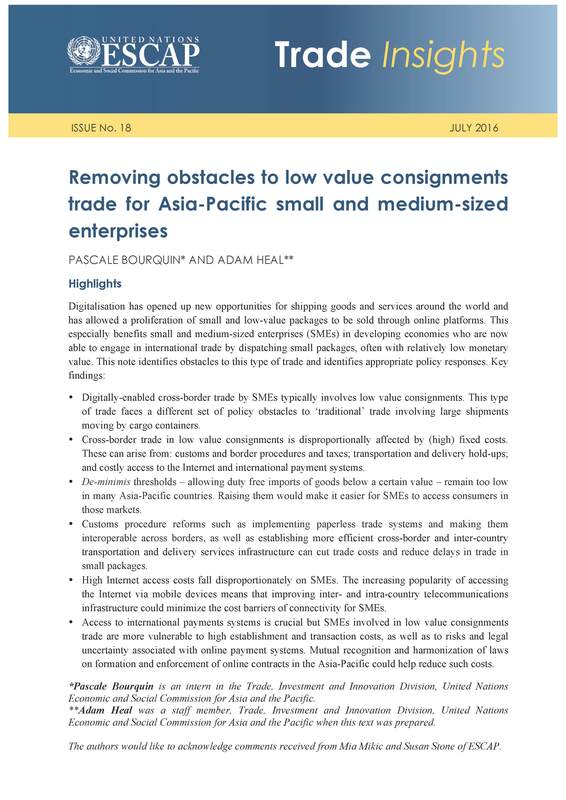 However, with companies involved in low value consignments trade being more sensitive to trade costs, and e-commerce particularly hinging on efficient delivery, transportation and payment systems, trade costs entailing high fixed cost components and lacking infrastructure can easily make trade uneconomic. In order for SMEs in developing countries to be able to reap the benefits of cross-border digital trade in low value goods, identified barriers must be reduced. This note identifies some critical actions including: raising de-minimis thresholds; lowering customs document requirements; establishing low-cost and efficient transportation, delivery services, telecommunications and broadband networks; and establishing a legal framework that gives players the confidence to conduct online transactions. The nature of cross-border digital trade requires that such policies be interoperable. Asia-Pacific countries should therefore strive to not only concentrate on improving domestic policies and procedures, but to additionally coordinate and work together with their neighbours to build the required infrastructure and to allow for mutual recognition or even harmonization of the systems, procedures, enforcement mechanisms and laws that affect digital trade.